I truly never thought that I would ever type or say those two words together, fingerpaint and glitter. It's been a long running joke that I tell my students at the beginning of each year that I'm allergic to glitter. I don't mind mess, but when it lingers on your fingertips, eyelids, desks, oh say everywhere for months, I'm not so into it. In honor of the fall feel to the air today, I embraced my inner glitter snob and conquered my fear. This simple outside art activity created a seasonal masterpiece for our home. I cut out some leaves using craft paper and an image from Google. After the grown up part was done, I let little Picasso take charge. We mixed Elmer's glue and water to make a solution perfect for glitter. 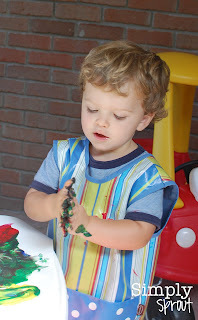 I held the leaves down, he painted the glue/water on with a paintbrush. Using a paper plate underneath, we sprinkled with glitter. I even bought glitter, there's a first for everything, and it's called Velvet Glitter. Very fancy isn't it? I really bought because it was a sample pack that came with lots of different colors. While the leaves were drying, the fingerpainting got underway. 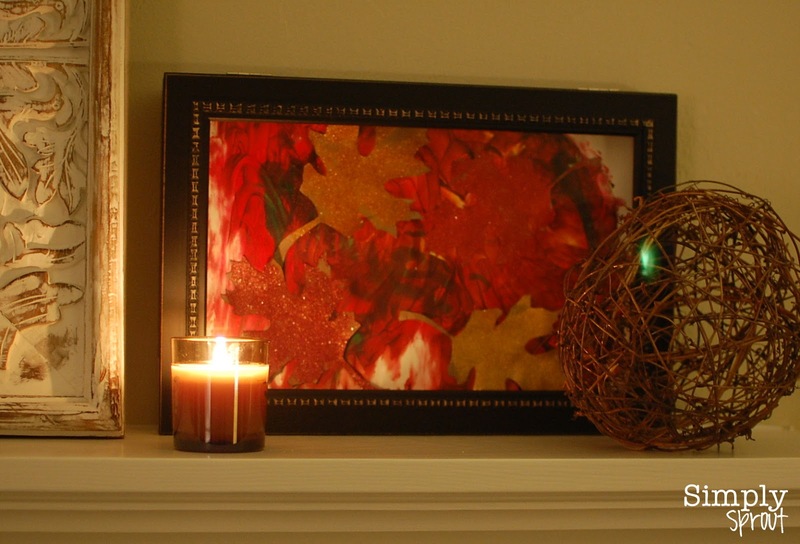 We chose some fall inspired colors, and Mack mixed them about. 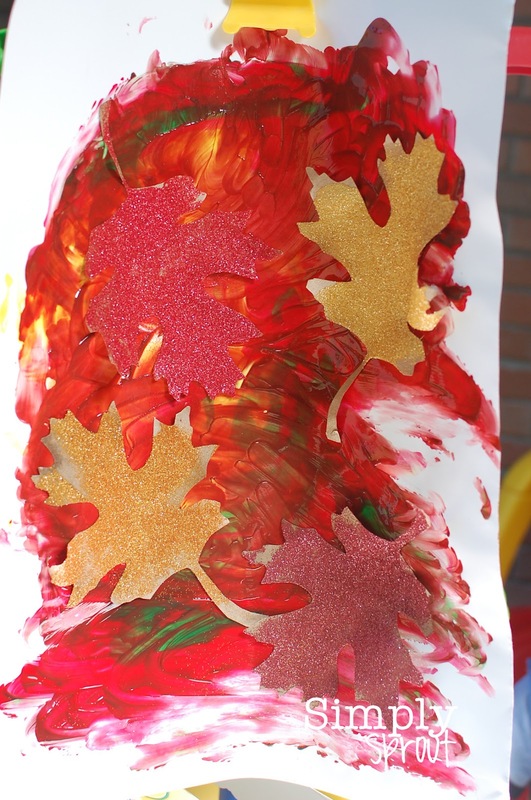 While the paint was wet, we stuck the leaves on the paper, and hung it up to dry. I remembered that I had an unused shadow box inside (usually around $12-$15 at a TJ Maxx or HomeGoods type store). I love to keep a couple to pop in seasonal things just like this. The box allows the dimension of the piece to really shine. Sounds very artsy doesn't it? This quick art project with your kids will add some fall feel to your home or classroom. What a wonderful way to introduce children to the idea that leaves change colors throughout the year. What a vivid reminder at how beautiful this season is. 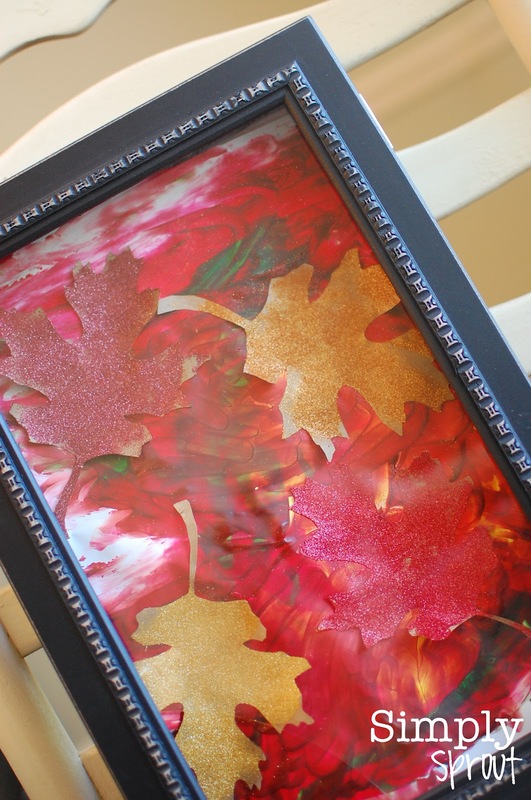 Fall art like this would make a great addition to our Fall Bulletin Board kit in the Simply Sprout store.